Coyote Blog » Blog Archive » Are We Really Going to Sell Socialism in This Country Based on the Fact that the Middle Class is Getting Rich? Of course we are, because INEQUALITY! Seriously, this is our new dystopic leftist ruling class. Create an alternate reality, pretend contrary evidence doesn’t exist (and that their own policies aren't the actual impediment to growth), and let the ignorant press do the rest. See also: global warming, higher education. Have any data on absolute incomes in the last decade? For the greedy, free stuff always sells. Demographics were mentioned. Retired people have lower income but also lower expenses. They are no longer saving for college and retirement, for example, nor supporting children. There is somewhat of a bulge in older people today. There are fewer people per household since number of children per family is down compared to 1971. 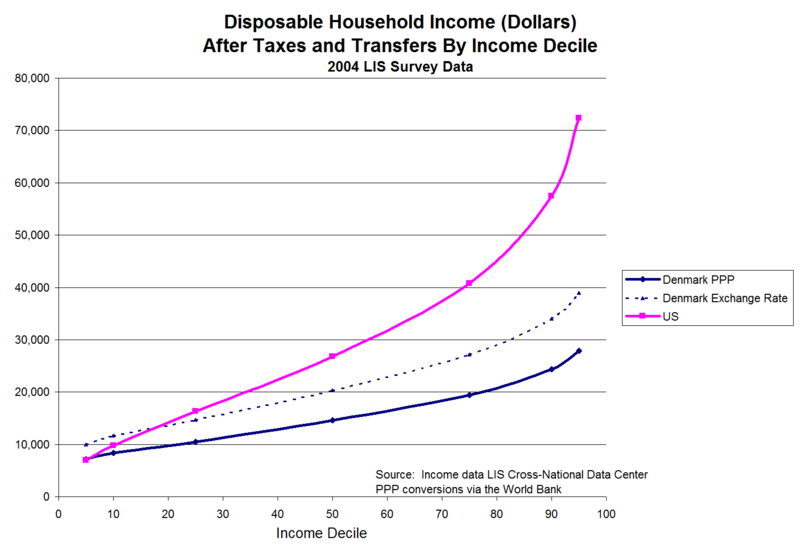 Thus $X income per household goes farther. There are more single earner families (or just single people). The best way to get into the "rich" category is to have two earners. Note that increase in the upper bracket in the graph is in spite of these factors and is thus even stronger than shown. be very careful looking at aggregates for recent income. 1. boomers are retiring. this drags the median down as they were at peak pay. 2. the biggest working cohort are the millennials. they are just starting. this also drags the median down. 3. the cost of non cash benefits have exploded and this is not generally included in income figures. 4. immigrants are also playing a huge role by coming and taking low paying jobs. consider an economy with 5 people. they earn 4, 5, 6, 7, 8. the median is 6. 2 more folks immigrate. they earn 3 (up from 2 at home). the others now earn 5, 6, 7, 8, 9. the median is still 6. this looks like flat income. but every single individual saw their income rise by 1.
now imagine that the guy earning 9 retires. this shifts the median lower for this third period. 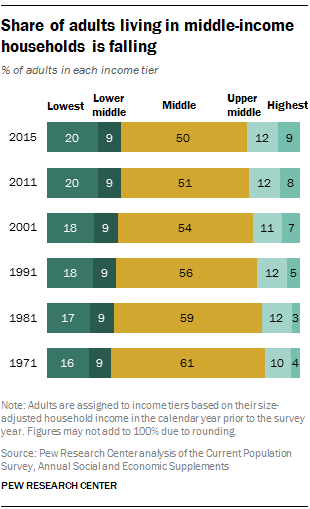 no one else lost any income, but median drops. and we have not even begun to address the issue that percentiles shift. the guy who was 50th percentile might be 75th 10 years later and the guy who was 99th may be retired. measuring what is going on with national incomes using simple aggregates like median income across time periods is MUCH more difficult than most realize. trying to use gini to measure inequality is even worse. imagine a society where we all earn $10 every year. perfect equality. now imagine another society where everyone earns $10 at 25 years old, $20 at 35, $30 at 45, $40 at 44 and $50 at 65.
clearly, you want to live in the second society. it's far richer. it's also perfectly equal in terms of lifetime earnings for each individual. but gini would call it vastly unequal because not everyone is the same age. there's a lot of populist muckracking about inequality, but it's very rare the metrics they are using mean what they are claimed to mean. whether this is because politicians are economically illiterate (they are) or deliberately dishonest (also a good bet) is hard to say (both is generally the safest answer) but the fact is that this debate is mostly taking place along dogmatic lines without regard to the actual data. Well, they might be getting rich, but they don't FEEL rich. They have a better life, more fiscal and personal security, more of the goods of luxury, but A: they got them slowly instead of all in a big lump, and B: everyone else around them got the same things at the same time. Familiarity breeds contempt. The note on the income chart using the Pew data indicates that the income figures are adjusted for household size. And demographics certainly do play a role. What I find odd is the seemingly arbitrary creation of income categories. For example, why is the "upper tier" defined as twice the median income, while "lower tier is defined as 2/3 the median or less"? In principle, it's possible that the distribution of incomes might allow for this, but there is no explicit reference to distributions in the chart, and the use of more 'round' figures, like 2/3 or twice the median suggests that these cutoff points were just arbitrarily chosen by the author(s) for ease of interpretation. I think there are a lot more poor, so the move to 20 percent being poor is much more than a few percentage points toward rich.